Raising your kids to love the outdoors is often easier said than done. My wife and I love the outdoors, and nothing would make us happier than if our seven-year-old daughter shared our zeal. Now, my daughter has a genuine interest in the outdoors–she climbs trees, loves to identify plants, is infatuated with wild animals, and can spend hours catching grasshoppers in fields–yet, it can still feel like pulling teeth to get her to go for a hike sometimes. I think I know the reason, but more on that in a minute. 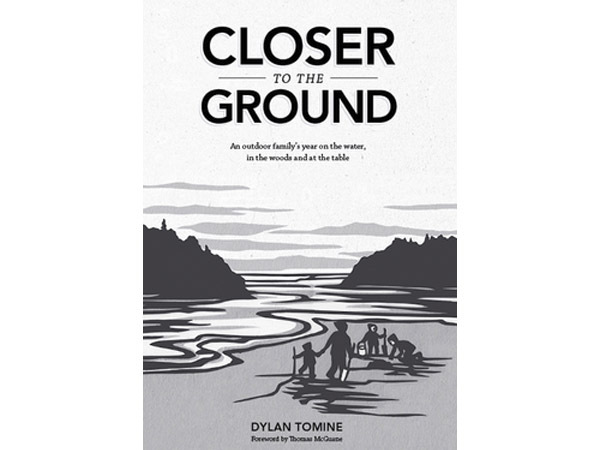 So, I just read Dylan Tomine’s Closer To The Ground published by Patagonia Books. It’s a compilation of stories about raising his two kids to enjoy a strong relationship with nature in the Pacific Northwest. They live in the woods on a small island in Puget Sound. Through the four seasons, he and his wife teach their kids how to plant raspberries, catch dungeness crab, hunt for razor clams, and make good compost soil. And through it all, their children become closely attuned to the seasons, and learn a little bit about protecting the environment and the hard, but rewarding work involved in sustainable living. It’s not off-the-grid living. They’re not “yurt-dwelling back-to-the-landers nor flag-waving bunker separatists,” as Tomine assures the reader. If they have a fruit crop that fails, or don’t catch enough salmon, or forget to chop firewood, it simply means they have to go the store a little more often. Tomine refers to his family as amateurs when it comes to living off the land. But, it’s still inspiring. In fact, it’s even more inspiring because it’s not too extreme. It seems more attainable and more realistic than leaving civilization completely behind. It’s wonderful. Some of the stories in Closer To The Ground remind me of my childhood growing up on Long Island Sound in Connecticut. My parents were not interested in living off the land, but I spent countless hours alone crabbing along the shore, fishing off docks, and wandering the thick, brambled woods behind our house. It’s where I developed my love of the outdoors and the wilder things. It gives me hope for our planet’s future to read about families intentionally instilling these values in their children. And I think that’s the point of Tomine’s book. It’s proof there really are smart, earth-conscious people out there doing their part to keep life simple. And it’s also a reminder that we all can do a little more to simplify our lives and the lives of our children. Everyone wins when we do. Now, back to pulling my daughter’s teeth to go hiking. Both my wife and I love the outdoors. We love to hike and backpack and camp. We love to go on long or short road trips to remote places. We love to snow shoe, ski and snowboard. And I love trail running and mountain biking. What it comes down to is that we love to explore open spaces and see new things. At times it might seem insatiable. And I think this may be part of the problem for my daughter. We like to jump into our adventures headfirst. It’s not adrenaline fueled. We’re just energized by the wild. My daughter, on the other hand, likes to take her time. Taking my daughter on a hike reminds me to slow down. It reminds me to literally smell the flowers along the way. Every…single…flower. Did you smell this one, Dad? Ooh, smell this one now. Look at this one. Can you smell it? Come on, smell it! The other thing I remind myself of is that the outdoors is a little intimidating. The wild is filled with more than just beauty. It’s filled with, well, wild things. Scary things. Dangerous things. Uncomfortable things. This, of course, is part of its allure for an adult who understands what they’re getting into. But, to a child it’s all new. I try to remind myself to let my daughter just be a kid. I want to expose her to everything this world has to offer, but also let her explore it all at her own pace. It’s her life and I want her to develop her own relationship with the wild, her own understanding of world. In the end, who knows which of our family adventures will stick with my daughter, which ones will be formative memories? Dylan Tomine reflects at the end of Closer To The Ground that he hopes his favorite memories of adventures with his kids will in turn be theirs. I hope so too.